Located on Fletcher in Ann Arbor between Eisenhower and US-23 is the Ann Arbor Power Center, also known as the UofM School of Music and Dance. The achitecture of the building alone is something to talk about, then go inside for an extraordinary atmosphere. It uses top-notch equipment and technology, along with rentable space for event occasions, seminars, and performances. This modern classic hotel is located right in the heart of it all, on the UofM campus. It’s prime location makes it perfect for family and friends to be nearby while visiting students at the University, and is within walking distance to the campus buildings, restaurants, theatres, and shops! Yost Ice Arena is the home of the University of Michigan hockey teams, figure skating, and holds open skate times for the public. The next UM game for the enthusiastic fans is Friday, February 19th at 7:35PM. Schakolad Chocolate Factory is sponsoring a Valentine’s Day Skate Thursday, February 11 from 8-9:50PM! Check out more info here. Not only do University of Michigan’s Men and Women’s basketball teams play at Crisler Arena, it also holds events such as gymnastics, high school graduations and concerts. UM Regents are considering a proposed major renovation that could begin in 2011….check out the story here. Keep an eye on the next men’s basketball game, vs. Northwestern, on Tuesday, Feb. 2, as they’ll need to win this Big 10 game to keep fighting towards NCAA’s March Madness ! Burton Tower, on Central Campus at the University of Michigan in Ann Arbor, is a clock tower built in 1936 with a grand carillon. It is the world’s third heaviest, and has 55 bells, with the largest bell striking every hour. Burton Tower contains classrooms & offices for the University of Michigans School of Music. What a unique, architecturally striking structure this University of Michigan building is! Opened in February of 2006, it is the largest research facility on the University of Michigan campus, housing more than 100 faculty and scientists. The center also features a 300 seat auditorium, sky-lit atrium and 19 procedure rooms, per typical floor. 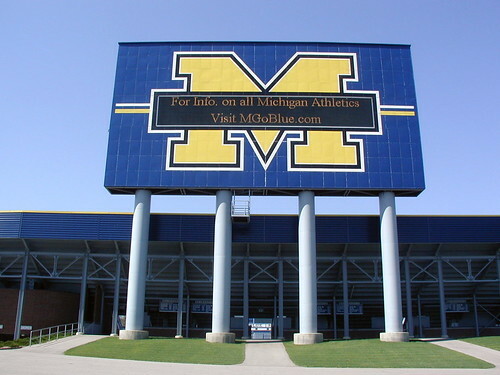 An Ann Arbor icon, this is the south scoreboard at the Big House. Football season is almost here, only a few more weeks! GO BLUE!